Many pet owners avoid dog foods containing too many carbohydrates. If you want a high protein and low-carb dog diet, you should know about the types of commercially foods available. Commercial dog food production follows the standards put forth by the Association of American Feed Control Officers (AAFCO). The minimum amount of protein in dog food for adults is 18 percent and 22 percent for puppies and diets for pregnant and nursing dogs. More active dogs, such as sport dogs, require about 25 percent, and athletic dogs, like sled dogs, around 35 percent. A high protein dog food is one in the higher range above 22 percent up to 65 percent for a normal dog. You should choose the level of protein based on your dog's own level of activity. When looking at the protein percentages on dog food, look at the quality of the proteins. Protein sources should provide necessary amino acids and focus on meat-based proteins. If you look at the ingredients for most commercial dog foods, between 30 and 70 percent are carbs. A low-carbohydrate food will be around 30 percent or less. Seek carbs from higher quality sources like fruits and vegetables. Avoid foods with wheat, corn, gluten, brewer's rice, oat meal, and soy flour. The proliferation of low-carb, high-protein diets would lead one to think that carbohydrates are bad for dogs. 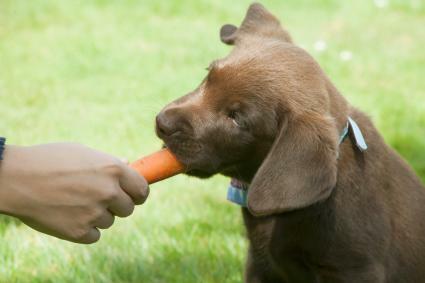 It is true that dogs don't need carbohydrates to thrive and they do not fulfill any necessary nutritional needs. However, good quality carbs can benefit a dog by providing fiber and nutrients that they would not receive from other types of foods. They can increase a dog's energy and keep their teeth clean as well. They also perform an important function in that carbs are needed in order to process kibble. Too much of lower quality carbs can actually decrease a dog's ability to absorb nutrients from its food. Low-carb diets may also be better for dogs suffering from hypertriglyceridemia, pancreatitis, diabetes and cancer. On the other hand, dogs with allergies and gastrointestinal diseases such as inflammatory bowel disease tend to improve on low-carb diets. Some pet owners seek a lower percentage of carbs in comparison to other foods whereas others want a grain-free diet. Manufacturers are not required to print the carbohydrate percentage in their food. You can estimate by taking the protein, fats, and moisture contents and subtracting them from 100 percent. Then, add about 8 percent ash. For example, a food has 50 percent protein, 10 percent fat, and 10 percent water. Subtract 70 percent from 100 percent, then subtract 8 percent, which leaves 22 percent carbohydrates. A protein content around 9 percent may not seem high. Canned food is primarily moisture, so it's 9 percent by volume of the remaining ingredients. For a canned food with a typical moisture of 75 to 78 percent, the remaining ingredients are 22 to 25 percent, and 9 percent is about 30 percent of the total ingredients. Many higher protein and low-carb dog food choices may be harder to find but may be available at specialty pet stores and online. 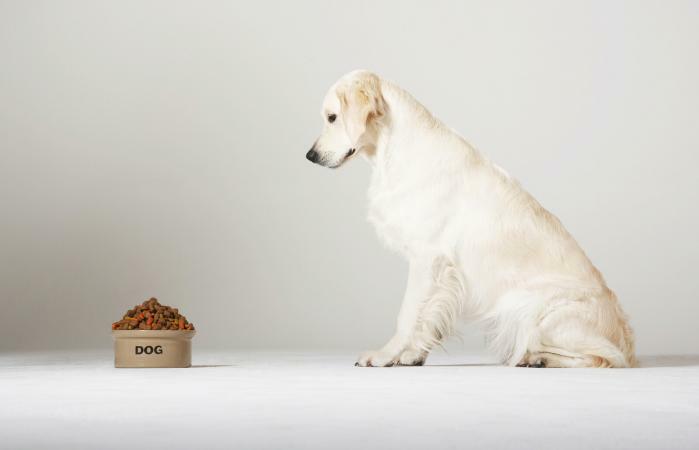 Top on Dogfood.co's list of high protein dog foods, Wysong Epigen has 63 percent meat-based protein. It's also the only starch-free food, based on Wysong's claims. The fiber content is 3 percent and fat 16 percent. Top ingredients include organic chicken, chicken meal, turkey meal, potato protein, and meal protein isolate. A 5-pound bag is about $28, a 20-pound box is about $100, and a 40-pound case is nearly $200. 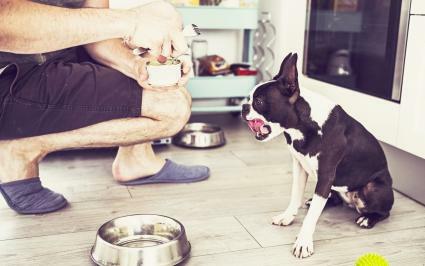 This dry dog food is on top lists of high protein food because 95 percent of the protein comes from chicken or duck instead of plant-based proteins or animal meal. The diet is also grain, corn, wheat, soy, and by-product meal free. It's also an excellent choice for people searching for a "low-carb, grain-free, and potato-free dog food. The chicken or duck formula dry food has 47 percent protein, 17 percent fat, and 3 percent fiber. Top ingredients include chicken or duck, eggs, tapioca, chicken fat, ground flaxseed, and natural flavor. The chicken version gets a 4.9 out of 5 star customer rating with the duck receiving 5 stars. A 20-pound bag of the chicken or duck is about $80, and a 4-pound bag of the small breed bites is about $27. Orijen gets a 5-star rating from Dog Food Advisor. Their Tundra Biologically Appropriate Grain-Free Goat, Boar, Venison, Duck & Mutton Dry Dog Food has 38 percent protein and 16 percent low-glycemic carbohydrates. Orijen is also a good choice for a high-protein, low-fat and low-carb combination food. The first five ingredients are fresh goat, fresh wild boar, fresh venison, fresh artic char, and fresh duck. A 25-pound bag is around $114. This canned food receives a 5-star rating from users on Chewy.com. The Chicken & Sweet Potato Recipe is grain-free and has 9 percent protein, 6 percent fat, 1.5 percent fiber, and 78 percent moisture. The top five ingredients in this low carb wet dog food are chicken, chicken broth, chicken liver, sweet potatoes, and flaxseed. A case of 12 12.5-ounce cans is about $24. The first five ingredients of this canned food are deboned beef, beef broth, beef liver, dried egg product, and dried yeast culture. It gets a 5-star customer rating. It's grain-free with 10 percent protein, 3.5 percent fat, 3 percent fiber, and 78 percent moisture. A case of 12 12.7-ounce cans is about $35. Although it's canned, the food is a loaf that can be sliced or mashed up for your dog to enjoy. This food is marketed as "human grade low carb dog food" and looking at the ingredients and preparation, it's easy to see why. The first five ingredients are chicken, organic flaxseed, potatoes, celery and sweet potatoes. The food is made from fresh organic produce at human food facilities. The food has 24% protein, 15% fat and 6.5% maximum crude fiber. DogFoodGuide chooses The Honest Kitchen as one of their top five picks for low carb dog food. A 10-pound box is about $66.00. Ketona claims to be a "first-of-its-kind" dog food with a carb content comparable to a raw food diet but for the price of kibble. The first five ingredients are chicken, pea protein, ground green peas, oat hulls and chicken fat. It has less than 8% carbs and 46% protein. Customers on Amazon give it a 5-star rating. A 24.2 pound bag retails for about $107.00. Boil the chicken gizzards for about 10 minutes until cooked. Add the three eggs during the last minutes for a hard boil. Cook the ground meat until browned, drain off the fat and take off the stove. Grind the peas, broccoli, cauliflower, apple, gizzard and eggs in a food processor. You may have to do this in two batches depending on the size of your processor. Microwave the sweet potato for three to four minutes until they are soft. Mix all the ingredients in a large pot, adding in the canned fish. Add the cottage cheese and oil near the end when the mix is cooked. Separate the food out into freezer bags or containers. This recipe is listed as enough for two nine pound dogs so you will have to estimate for your own size dog. DogNoteBook's High-Protein, Low-Carb Chicken - this recipe is easy to make and includes ground chicken, rice, mixed vegetables, and supplements. DamnDelicious has a simple recipe for dogs that is 50% protein (turkey), 25% veggies and 25% grains but you can also adjust those percentages based on your dog's needs. CanineJournal has a recipe for grain-free chicken jerky strips for owners who are concerned with preservatives in commercially prepared dog treats. Purina Pro Plan Veterinary Diets OM - This canned dog food is available by prescription only. It has 7.5% protein, 1% fat (minimum), 6.5% fiber (maximum) and 82% moisture. It sells for about $34.00 for a case of 12 cans. It also available in a dry formula for $85 for a 32 pound bag with 26% protein, 4 to 8.5% fat, and 16% fiber. Both the dry and wet formulas get five star reviews from Chewy.com users. Royal Canin Veterinary Diet Canine Glycobalance - This is another food that gets high marks from Chewy.com users with 4.8 out of 5 stars. It's available with a prescription from your vet. A case of 24 cans is about $68.00. This low carb dog food for diabetic dogs has 7.5% protein, 2.5% fat, 3.5% fiber (maximum) and 82% moisture. It's dry food equivalent has 35% protein, 10 to 14% fat, and 10% fiber. A 17.6 pound bag retails for about $53.00. Daily Dog Stuff lists five dog foods as their top picks for diabetic dogs. In addition to the previously mentioned Merrick, Orijen and Royal Canin options, they recommend Wellness CORE Natural Grain Free Dry Dog Food which retails for about $63 for a 26 pound bag. They claim their food has 80% more meat than other dog foods with 34% protein, 16% fat and 4% fiber. Wellness Core comes in several flavors and is available in a canned version. It gets 4.3 out of 5 stars by users on Amazon.com. One food that you should avoid is peanut butter, which is high in fat and sugar. However, some vets recommend using a low-fat version in tiny amounts on celery as a treat, or almond butter. Some healthy dog food enthusiasts will claim that yeast infections are brought on by high carb foods with too much starch and sugar. However according to PetMD, the level of sugar and starch in a dog's food will not make any difference in the amount of glucose that the skin receives. Yeast infections are brought on allergies or immune disorders and should be treated by a veterinarian who can discuss healthy diet options with you. According to the Clinical Nutrition Service at the Cummings Veterinary Medical Center, no proof has been found through research that low-carb diets are better for dogs with cancer compared to any other diet. Low-carb diets are often recommended for dogs with cancer because of a belief that low carbs will reduce the amount of sugar going to the cancer cells. However, like with yeast infections, low-carb foods will not have any appreciable difference on the amount of sugar going to the cells. 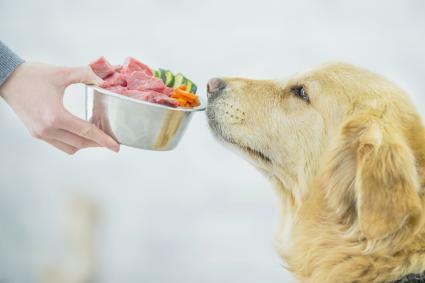 Veterinarian Dr. Susan Ettinger of the Dog Cancer Blog recommends focusing on the quality of carbohydrates you are feeding the dog such as fruits, vegetables, and high quality grains. Remember every dog is different so you may need to test out a few brands. Make sure the protein level is appropriate for your dog's daily activity level.